Now that San Francisco Chronicle reporters Mark Fainaru-Wada and Lance Williams aren't going to jail for their stories about Barry Bonds, they're getting awfully cocky: They're now exposing the Orwellian practice of shutting down anti-Bonds signs at baseball stadiums. After [Don] Regole had written the team to complain [because his sign was taken down], he got a letter from the Diamondbacks. 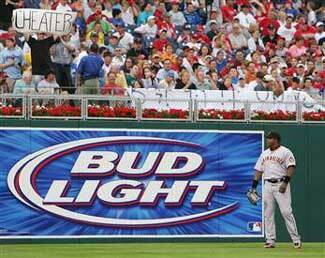 One sentence caught his attention: "As Mr. Bonds approaches the homerun record, we have been asked by Major League Baseball to carefully screen the signs that are brought into the ballpark by our fans." We suspect this won't be a problem at the All-Star Game next week. Personally, we can't imagine any sign worse than the guy who threw a syringe at Bonds last season; flying needles are never fun. We just hope someone makes a sign that says Please Don't Let Kimberly Bell Write A Book (For The Sake Of The Nation)."